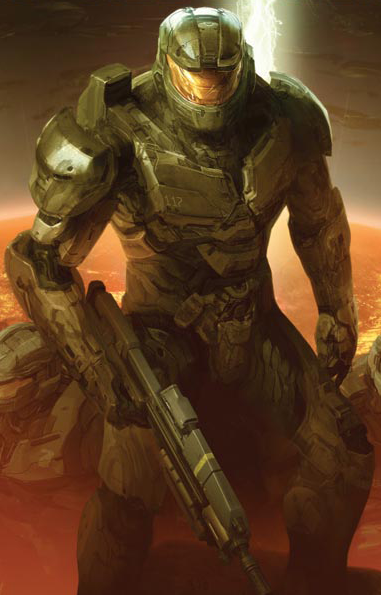 My latest PopMatters article is now live: Halo 4's Master Chief and Community Ownership. This post came about for two reasons, first, I read the Wired article by James Verini on digital pop-star Hatsune Miku. The animated icon's existence is a testament to community involvement in the continued construction of a cultural artifact. Where ten years ago the idea of a virtual songstress with thousands of adoring fans eager who create costumes, songs, and music videos for her might have sound so very "Japanese", today it seems like a natural byproduct of larger-than-life characters. Second, I was genuinely surprised by how instantly compelling I found Master Chief when he woke up. I am a pretty optimistic guy, but I do not think I'm a fanatic when it comes to video game characters. Regardless, hearing Cortana speak and watching Master Chief wake-up was stirring - I got the chills. In a weird way, the continuation of his story feels "right". The 343 transition, with the power of hindsight, seems natural. In a way, Master Chief is becoming like the Doctor. With a sort of cultural immortality firmly established, why not slowly relinquish the idea of complete character control? The idea our favorite video game characters could become diffuse, spread out among traditional creators and community creators, is not so alien. I don't want to undervalue 343's contribution to the character and their smart handling of the franchise, but in a way, Master Chief would have risen eventually anyway.